If you’re not careful, “customer-first marketing” could just be mere words. You could deceive yourself and label anything as customer-first marketing just to make yourself feel good. To get deep for a moment, I was thinking about this recently because it is the season of repentance in my tradition. A chance to re-evaluate not just our words, but our actions. Wouldn’t it be great if we had a similar tradition in marketing? 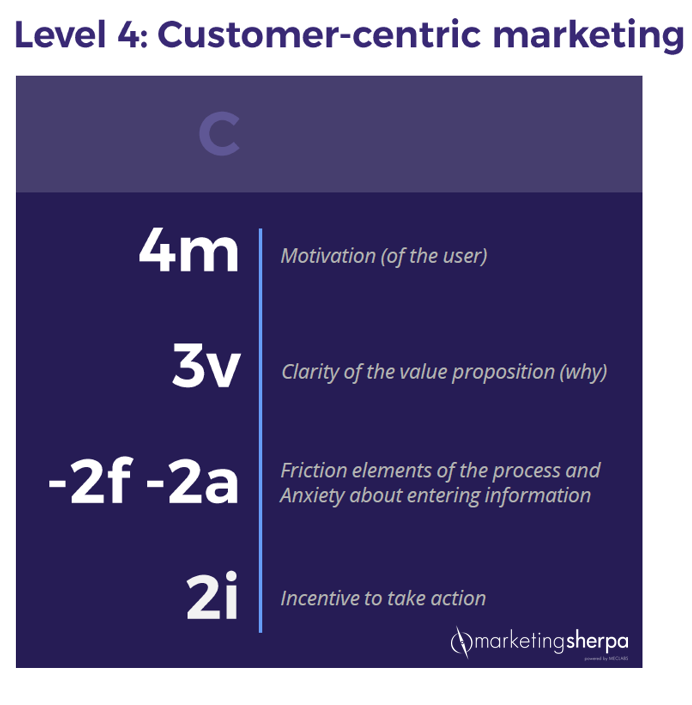 To help you get beyond mere buzzwords and make that evaluation of where your company is on its path toward strategic, customer-first marketing, we created this simple look at the five levels of marketing maturity based on our research with 2,400 consumers. When we were creating this framework, we knew we needed a methodology to reference that would clearly communicate the different levels. After thinking about it and debating it, we realized we had a pretty good model to base it on from MarketingSherpa’s parent research organization, MECLABS Institute. Until now, the heuristic has always been displayed linearly, as you see above. 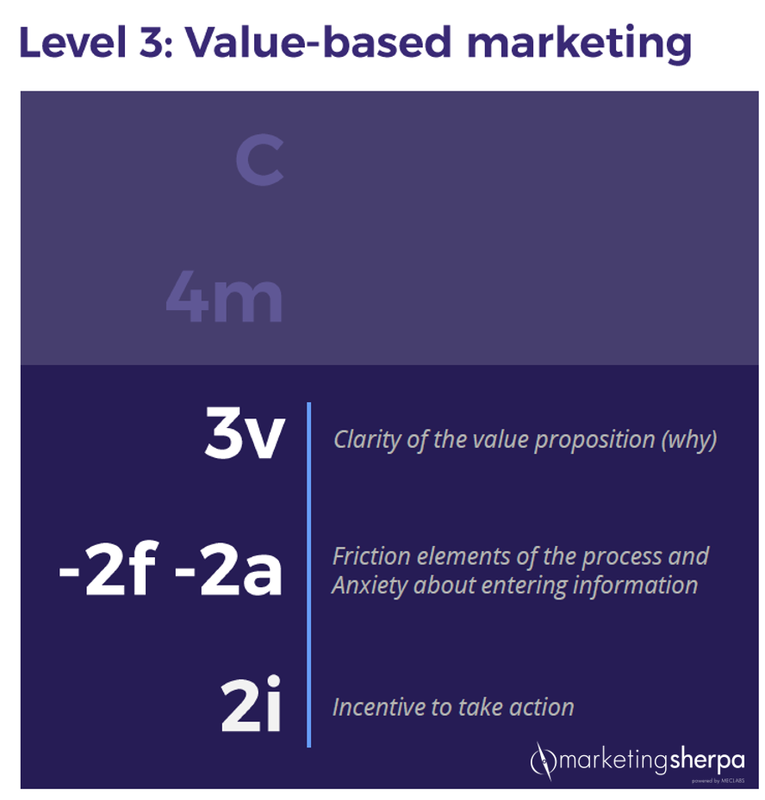 However, we realized if we stacked the elements of the heuristic, it would be a clear representation of the levels of marketing maturity. Each level is inclusive of the level that came before it and builds on it. 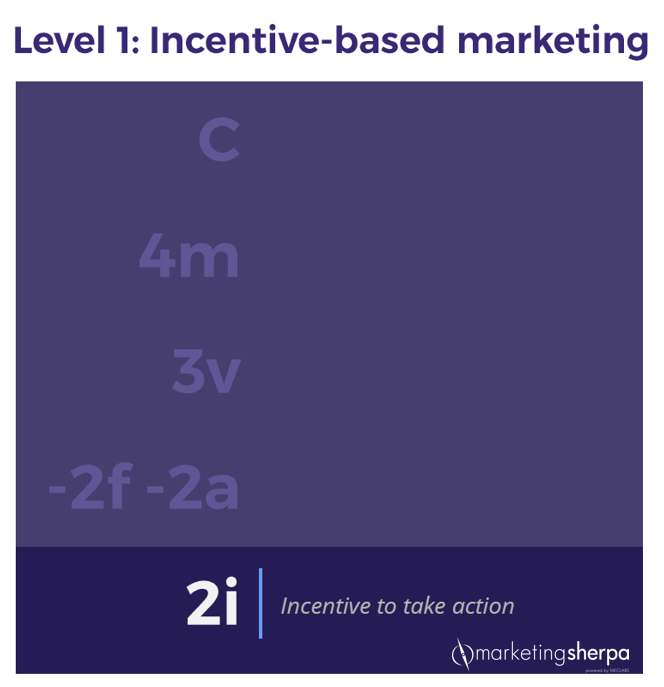 At the base level, companies use incentives to encourage customers to take a conversion action. If enough resources are invested in incentive-based marketing, it can result in meeting the desired KPIs (key performance indicators) in the short term. However, it will cover up serious flaws in the product and business that hinder long-term, sustainable competitive advantage. By building on traditional marketing incentives with a seamless customer experience that reduces friction and by utilizing marketing messaging that reduces anxiety, businesses will have further success. However, their long-term success and margins will still be weighed down by the cost of expensive incentives and factors that competitors can easily replicate. While we discovered that an easy purchase experience is indeed important (the top selection from both satisfied and unsatisfied customers), we also discovered that an enjoyable purchase experience was the top differentiator between satisfied and unsatisfied customers, hence the importance of customer-first marketing. A differentiated, appealing value proposition entices customers to act for more than ephemeral reasons and is difficult for competitors to replicate. At a higher level, companies incorporate the motivation of the potential customer into their marketing plans. This results in more targeted and personalized marketing — with the customer at the center of the design — and delivery of the value-based messaging, seamless customer experience and incentives. Customers receive more relevant offers and information targeted to their needs and are therefore more likely to convert than when receiving general messages about the value of a product. 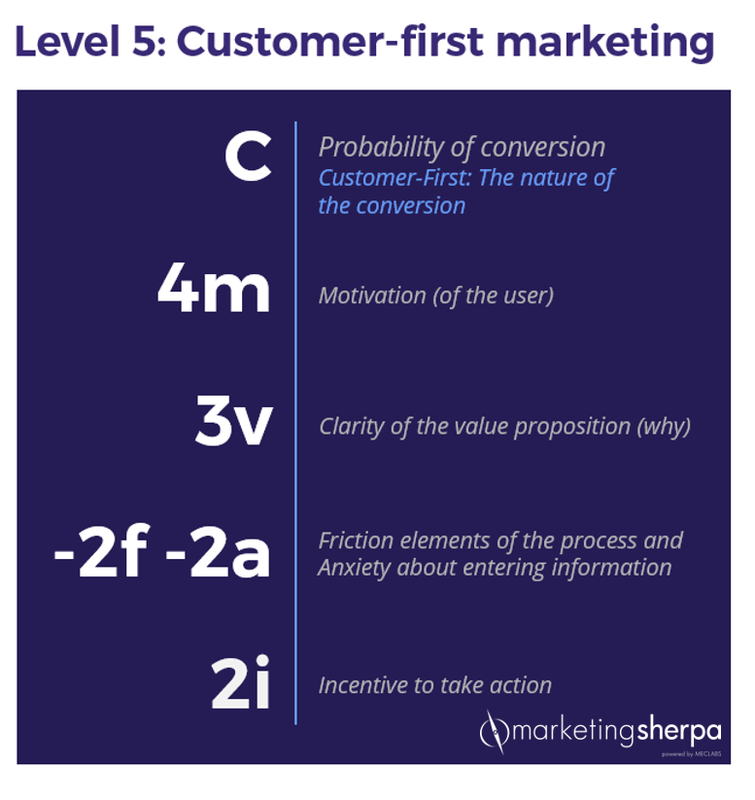 The highest level of marketing maturity is customer-first marketing. 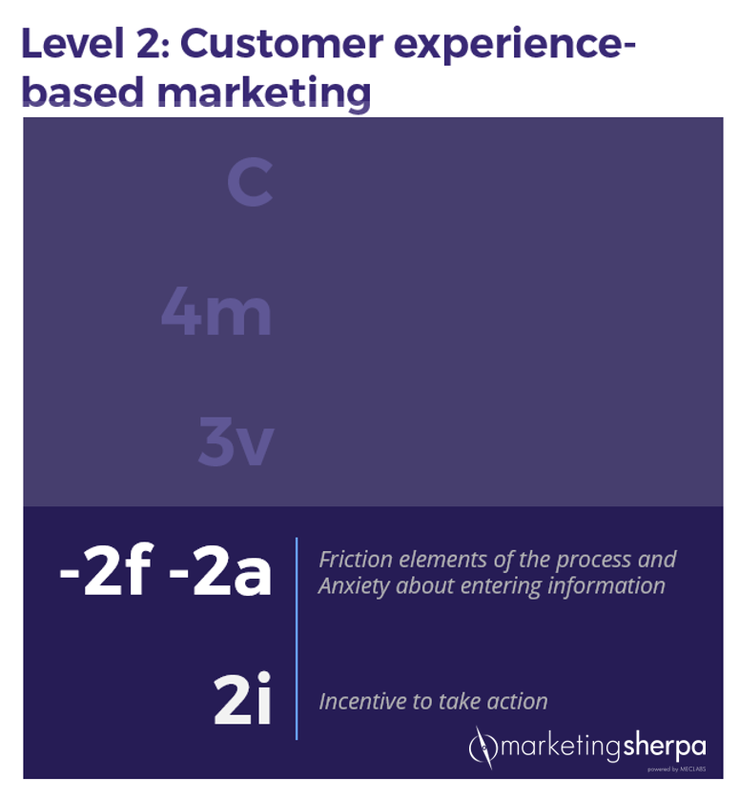 In this practice, marketers move to the other side of the equation — not only exploring how to increase the number of customers who take an action, but the very nature of that action itself. These companies choose conversion goals that are in customers’ best interests and focus on providing value to the customer at every single interaction, which may mean sacrificing short-term goals (i.e., leads generated, quarterly sales goals) for ultimate long-term gain. As a result, customers perceive that the company is acting in their best interests, have a better relationship with the company, and view it as a preferred option. For an excellent example of customer-first marketing, we can look to HCSS. The heavy construction software company was able to increase revenue 54% by focusing on what its customers most needed. In listening to its customers, HCSS discovered that the biggest challenge these construction companies face is bringing more high-quality candidates to the industry. So, even though its software doesn’t provide this direct service, it built a movement called I Build America. This intense focus on customer needs raised HCSS’ profile in the industry and enabled it to compete with much larger companies. Of course, not everyone is the VP of Marketing. And not everyone can influence the entire direction of the company. So ask yourself — what can you do within the decision points you control? What can you do to put the customer first within your piece of the overall organization? To get you thinking, you can read this case study about how MasterControl ran a 45-page test to achieve a 52% lift. By providing a clearer flow through a resource page, Website Optimization Manager Bryce Miller enabled customers to get what they needed much faster and easier than before. Ask MarketingSherpa: Copywriting for non-native English speakers Marketing 101: What is CRO (Conversion Rate Optimization)?